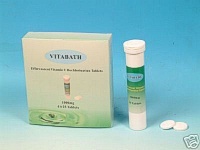 Neutralizes chlorine and chloramines in bath, hot tub and spa water. NOTE: The pharmaceutical grade Vitamin C is made from non-GMO Certified Organic Corn. From Anonymous of Montreal, Quebec on 6/3/2017 . From Anonymous of Durban, Alaska on 5/25/2017 .